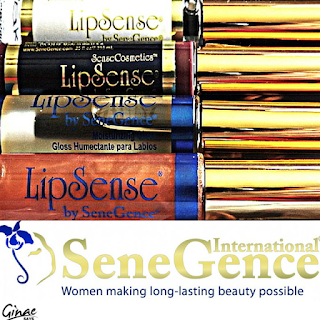 SeneGence is a company founded by Joni Rae Rogers-Kante, who set out with some lofty goals for her company. She wanted a company which would provide a financially limitless opportunity for others and she did that. She wanted for her products to be unique and they are. It's all in the ingredients. She also wanted to thwart environmental waste and destruction wherever possible. Rogers-Kante cares about others too. She created a non-profit sister company which assists women and children who need it. The Make Sense Foundation is assisted with funds from SeneGence and through other means. The LipSense is just wonderful. We applied a fresh coat @ 7:00 a.m. today and it's now 6:30 and we are still going strong. Even after eating and drinking throughout the day, the color is still present. This is what lipstick companies used to do. We like it. The rose gloss gives only a minimal color. However, it's still a nice glossy sheen. It smells divine. The clear gloss isn't thin like most glosses. It's also not gloppy. It has no aroma. The Lip Color Remover didn't fare as well as the others. It simply doesn't work. We tried to remove the LipSense lipstick and it only lightened the color. This was a few minutes after application too. This product was a surprising disappointment.